I’ve always thought that music and writing go pretty well together. Writing to music is kind of like getting the chance to create a soundtrack to somebody else’s life. And just like how the right song playing on your iPhone can change the way you feel as you walk down the street—the right song played while writing can help me develop a scene in a novel, or discover another layer of emotion or intensity I didn’t know was there. The Crickhowell School for the Muses has an ominous, gothic tone throughout. One might think I listened to an equally eerie album while writing it, but I have a confession to make: I wrote almost the entirety of the novel listening to one thing—a CD of seventeenth century Scottish lute music recorded sometime around 1992. While the Scottish lute isn’t exactly foreboding, listening to it helped me envision the pre-industrial English countryside, which is ostensibly where the novel takes place. If I couldn’t actually cross the ocean and go back in time, I could at least trick my ears into thinking I had. 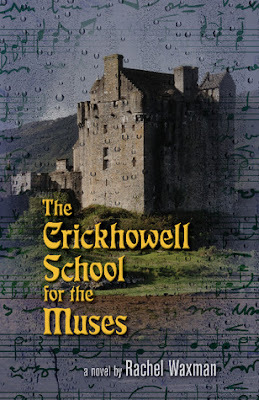 Not only did music play a large role in the writing of Crickhowell, it plays an important role in the novel itself. The protagonist, Awen, is a singer—trained to sing so beautifully she could inspire an artist to create a masterpiece. She is also forced to confront some difficult questions in regards to music: What happens when the thing you love most is taken away from you? What happens when singing ceases to be a source of joy, and becomes a chore? Hannah’s room was small, but the floor-to-ceiling mirrors on each wall gave the illusion it was double its size. In the corner, facing a small window, stood a wooden desk with stacks of paper, combs of all sizes, and tubes of colorful pastes strewn about. A tall wooden stool was situated in the center of the room. “So, what does this girl need today?” Hannah turned to Rosaline. “Cut? Dye? Everything?” She gave a euphoric laugh. “Here, jump up on the stool, would you, now?” This time she spoke to Awen, who was looking down at her feet—bare, just like every other girl’s at Crickhowell. Awen hesitated, but a word of encouragement from Hannah made her climb up onto the stool. She winced slightly, feeling the bruises from her fall. “You have very pretty hair,” Hannah said, twisting a section in her hand. “Nice and black, thick, wavy...but I think... Hmm.” She dropped Awen’s hair and put two fingers to her lips. “Yes, I think we need a good trim.” She ran her other hand through Awen’s tresses, pulling through the tangles. “It’s a bit of a mess. “Now...” She took Awen’s chin in her hand, examining her face. “White powder, of course...hmm, very pretty eyes, yes. Ah, this one is easy—already pretty! They haven’t all been so, recently,” she added in a lower voice. With that she turned to Rosaline, who was leaning against the wall opposite Hannah’s desk. “Stupid, though,” Rosaline muttered. “Stupid girl, she can’t even walk down the stairs without tripping over herself.” Hannah dismissed this with a click of her tongue and turned back to her black-haired project sitting silently on the stool. She eyed Awen once more, walking a circle around her, then glided over to her disorganized desk. From the reflection in the mirror, Awen could see her pull out a large comb, a silver pair of scissors, a jar of white powder, and a thin glass vial. She slipped all but the comb into her pockets. Awen watched in the mirror as Hannah combed through her straggled mess of dark hair. The tangles were so entrenched that the movement of the comb pulled her head sideways. She had to squeeze her fingernails into her palms and squint her eyes to keep from tearing up. Then, Hannah pulled out the scissors and began to clip off chunks of hair. Awen let her eyes close most of the way as Hannah worked. The sound of clipping scissors eventually stopped, and Awen opened her eyes, assuming Hannah was done. Before she could look at herself in the mirror, Hannah’s hands were at the side of her head, pulling on her hair with the force of a rider reining a wild horse. Awen felt the skin on her forehead pull upward. Her hair was yanked tighter, twisted around on itself. “Ah, beautiful!” Hannah exclaimed, jumping back, and praising her work from all angles. Awen gazed at her own reflection in the mirror. Her hair had been twisted into a bun so tight, it looked like her eyebrows were raised. “Now just a little makeup, and we will be done! Oh, brush!” she exclaimed, skipping back to her desk for the tool. While Hannah rummaged in her desk, humming to herself, Awen peered out the small window, through its reflection in the mirror. She heard slowly approaching voices coming from outside. The words were hard to make out—something about a window, an accident and, most startlingly, the word child...and the word dead. Two women walked by the window without looking in. And then she saw it. A man carried a dark-haired girl halfway wrapped in a blanket. Awen could see her face: drained of color, expressionless, blue lips, blue eyes and a big gash across the top of her forehead. Awen’s eyes widened, and a sick feeling waved across her stomach. The other women in the room gave no response. Awen wondered if they had not heard, or if maybe the event meant nothing to them. 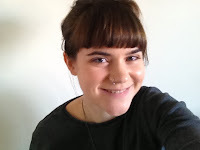 Rachel Waxman is a writer, oboist, and entrepreneur. While at Northwestern University she studied music and spent her Sundays writing. She has a contradictory affinity for old books, castles, and new technology and is nostalgic for the eighteenth century. A Kansas City native, she now lives and writes in New York City. Girl Who Reads is an Amazon and IndieBound advertising affiliate; a small fee is earned when purchases are made through the links above. The opinions, views, and beliefs express by contributing authors are their own and do not necessarily reflect those of Girl Who Reads. Not nerdy at all! It's good to have inspirational background music when writing! I love the concept of having music on to inspire your writing. You never know what will come of it!